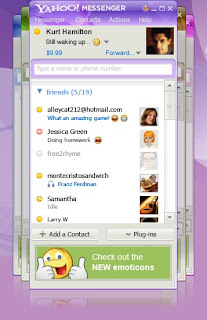 Installed Yahoo Messenger 9.0 !! You might be getting annoyed by the ads in the bottom . So how to remove these annoying ads on the bottom of Yahoo! Messenger 9 window ? Clear its content and save it (as an empty file) . Now change the properties of the file (urls.xml) to " Read Only ". Download the file from http://www.megaupload.com/?d=C5JRI65V (size : 25KB). Run the file and click Patch . If it gives up a pop-up saying “Can not find the file. Search the file?”, then click Yes and show the path of your yahoomessenger.exe ( normally it will be C:/Program Files/Yahoo/Messenger/YahooMesssenger.exe ) and click patch. After it says patching is done . restart Yahoo Messenger to see the bottom banner being removed. How to detect a invisible user on Yahoo Messenger ? BitDefender 10 found a trojan on this patch, so you shouldn't use it. NOD32 found a trojan too. so don't download!! 2: Change the value of "Enable Messenger Ad" from "1" (true) to "0" (false). The ads can be removed from all version 9's. Here's 4 simple steps to remove those annoying ads in you Yahoo Messenger. 3) Find this line "127.0.0.1 localhost"
4) Add after "127.0.0.1 insider.msg.yahoo.com"
We are aware of this problem, and trying to find a good soultion. I have a friend (Chris E.) who may write a 32-bit version of the patch for us if he finds time. In the mean time, you may d/l the already patched exe for ver 9.0.0.2034 at the link below. if you could please re-up the file it would be of great help. Below is a link to download an HTML file. Download the HTML file and open it in your browser. It provides links to download the pre-patched exe files for all 28 countries. No need to patch or otherwise modify the original exe! Write locking means to alter the permissions by unticking "write" and "append" attributes. (Google for that). "Program Files (x86)" is available only on x64 Windows editions... it equals to "Program Files" in regular Windows. Write-lock just the last one the same way, through permissions on the "Locale" key in the tree pane. Works with 9.0.0.2112 in Widows 7 x64. My pleasure - I should mention that Tim and Dermot also have patches for these newer versions. These guys are good programmers, and are working out the bugs, etc. I am not sure of the status of their programs, as I am crunched for time, and have not tried their patches recently. When I get a little more time, I will provide a better patch. I am working on removing the chat transition dialog window and providing international support. it also reflects "Update" information that is sometimes incorrect. Mine says my mood changed from happy to excited to special and back to happy again. I never changed anything to give the server that impression. Perhaps it is reflected from the emoticons I may have used in a conversation. This information comes from the server in the Temporary Internet Files in a file named "vitality.html". I also find the use of IE annoying. If you want to disable the cards, find the folder "C:\Documents and Settings\(YourWindowsUserName)\Local Settings\Application Data\Y!Msgr\skins\Default". In that folder, you will find a few xml files. One is named ContactCard.ContactCard.xml. Delete the file and create a folder of the same name in its' place. After that, you may have to sign in and out of Messenger twice, but the contact info cards will be gone. Also gone is the IE download of the vitality files. Notice that the trick to remove the cards is on a per-user basis, while disabling the vitality "updates" is on a per-computer basis. Tim and Dermot - you guys may want to add this to your patch programs. I apologize for taking so long. I have been busy. Also, they are creating releases like horny rabbits. followed the instructions @ the top of this page (clear the url.xml, set to 'read only'/etc). (big red "X" in a red circle): This application has failed to start because YImage.dlll was not found. Re-installing the application may fix this problem." im running vista 32bit. any suggestions? *slaps forehead* re: "unable to locate component"
fig'd it out, pasted the patch in the C:\Program Files\Yahoo!\Messenger folder. thanks for the PATCH--2 thumbs up!! same primary e-mail address, you may lose the account. This is a gradual change; I have seen no official announcement. "primary" e-mail addess would become inaccessible. Second, I noticed that, by the end of the year, Yahoo! intends to do away with geocities free hosted sites. info or downloads, best get crackin and get what you want.